A woman gets spotted while bench pressing. 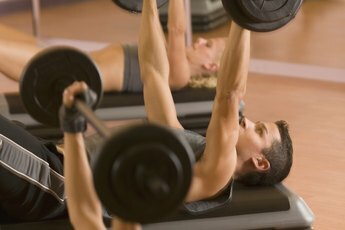 The press is a basic weight training exercise to work out your arm, shoulder and chest muscles. You can do presses with a barbell on a bench or with dumbbells. The exercises are similar, but dumbbells allow more flexibility. Guys generally prefer bench presses, because barbells can hold more weight, while girls tend to favor dumbbells because they are lighter and easier to handle. Serious weight trainers use both presses. For a basic bench press, lie on a weight bench with a barbell directly over your head on its support brackets. Grasp the bar with both hands about shoulder width apart and lift it off the bracket. Inhale as you slowly lower the bar to touch your chest, then exhale as you press the bar up until your arms are straight. 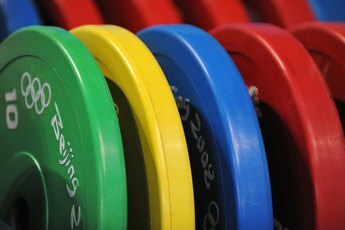 Use a weight that requires effort but not strain to lift. Always work with a spotter behind the bench to help you if necessary. You do dumbbell presses on your back, on a bench or on the floor. Hold a dumbbell in each hand just slightly above your shoulders. Take a breath and exhale it as you press the dumbbells up until your arms are straight. Pause slightly, then inhale as you slowly lower the dumbbells to your shoulders. Keep your elbows close to your sides to stress triceps, slightly away from your body to stress shoulders. Start with light dumbbells and increase the weight and repetitions as you get stronger. Set a weight bench at an incline -- about a 45-degree angle -- to do either barbell or dumbbell presses. Follow basically the same routine. You lift the barbell above its supports at arm's length and lower and raise it, or hold dumbbells in each hand at your shoulders, then press them upward and lower them. Inhale as you prepare and exhale as you press. It's easy to increase the weight on barbells as you gain strength by changing the plates or adding more, which will increase strength. Dumbbell presses can work more muscles because they can be lowered below chest level, while a barbell stops at the chest. Dumbbell presses also are gentler on shoulders since they afford a greater range of motion. The only real negative to using dumbbells is that they are more limited in weight, but this is usually not a factor for women. Can Using Dumbbells Every Day Make a Difference?